Healthy and functioning ecosystems are necessary for the survival of human beings as they provide life supporting goods and services. These goods and services are often called as ecosystem services. As well as underpinning life on Earth, they provide major inputs to many sectors of the economy, and support our lifestyles. They include such processes as biological control of pests, weeds and diseases, pollination of crops, amelioration of flooding and wind erosion, provision of food (including fisheries), the hydro-geochemical cycle, capture of carbon dioxide by plants and carbon by soil, maintaining tourism revenues etc. Their value been demonstrated to be worth US$ 33,000 billion each year – more than three times that of the world’s largest economy (USA), and equal to global GDP in the year 2000. In other words, mankind cannot survive without healthy and functioning ecosystems. However, ecosystems and their services worldwide are being degraded more rapidly than ever before and this degradation poses serious threats to quality of life and modern economies. The Millennium Ecosystem Assessment (MEA) pointed to the very high rate of loss and the consequences for global stability if that rate continues. Asia hosts nearly one third of the human population. When massive industrialization is occurring at faster pace to support the lifestyles of growing population, impacts on natural ecosystems are inevitable in this region. 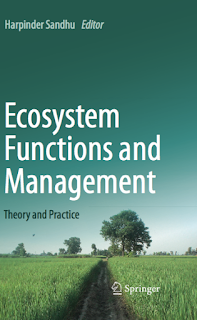 Globally, ecosystems have been studied in much detail, however, vital information on the key local ecosystems, their functioning, state of health etc. needs to be addressed in Asian context particularly in Indian sub-continent. Therefore the current book entitled, ‘Ecosystem Functions and Management’ addresses six key ecosystems in Indian continent - rural, urban, desert, freshwater, forests and mountain ecosystems. It explores the concepts, theory and practice regarding these key ecosystems by linking them with the livelihoods of a large population base and subsequently illustrating their importance for sustainable development in the region. Further, by suggesting policies and ways in which these systems can be maintained and enhanced, it facilitates better management of natural resources within the ecological constraints to achieve socio-economic objectives and move towards a green economy for sustainable and equitable development in the region. Author: Harpinder Sandhu is a transdisciplinary scientist whose research interests include studying the interactions between society and the natural environment to achieve sustainability. His research involves the integration of environmental economics and ecology to achieve a better understanding of the complex socio-ecological and economic dimensions of ecosystem services and their implications for equitable and sustainable development. His current research focus is on integrating an ecosystem services approach with the capability approach to address development agendas. Harpinder is further interested in establishing a bridge between the natural and social sciences by incorporating ecosystem services issues to address the gap between science and policy for sustainable urban and rural landscapes. Harpinder received his PhD in Agroecology from Lincoln University, New Zealand and is currently affiliated with the School of the Environment, Flinders University, Australia. Harpinder is contributing as a Lead Author to an ongoing United Nations Project—Intergovernmental Platform on Biodiversity and Ecosystem Services (IPBES) for two deliverables 3a (Pollination Assessment) and 2b (Asia Pacific Regional Assessment of Biodiversity and Ecosystem Services). He also heads the Global Sectoral Group on Agricultural Production Systems and Thematic Group on Poverty Alleviation at the Ecosystem Services Partnership (ES-Partnership), which is coordinated by the Environmental Systems Analysis Group, Wageningen University, the Netherlands. Harpinder was nominated to the advisory panel of the Multi-Stakeholder Consultation on Agroecology for Asia and the Pacific at the Food and Agriculture Organisations of the United Nations. He is also a contributing expert to the Biodiversity and Ecosystem Services Network (BES-Net) Asia Pacific, part of the United Nations Development Program (UNDP).